Far Cairn Rally is always a good weekend away. 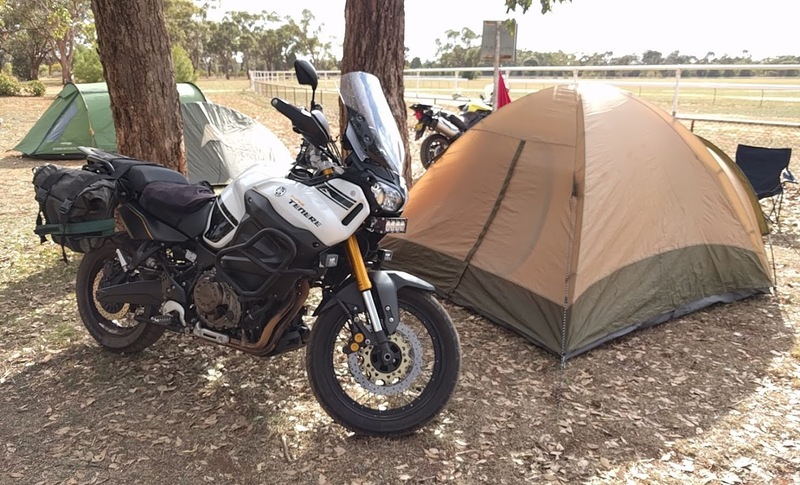 Told my employer they could do without me on Friday and at 5am I was on the road, heading north up the Hume for a couple of hours. Turnoff just after Wangaratta and stop in Corowa to collect David and Anthony who were eating breakfast when I arrived. 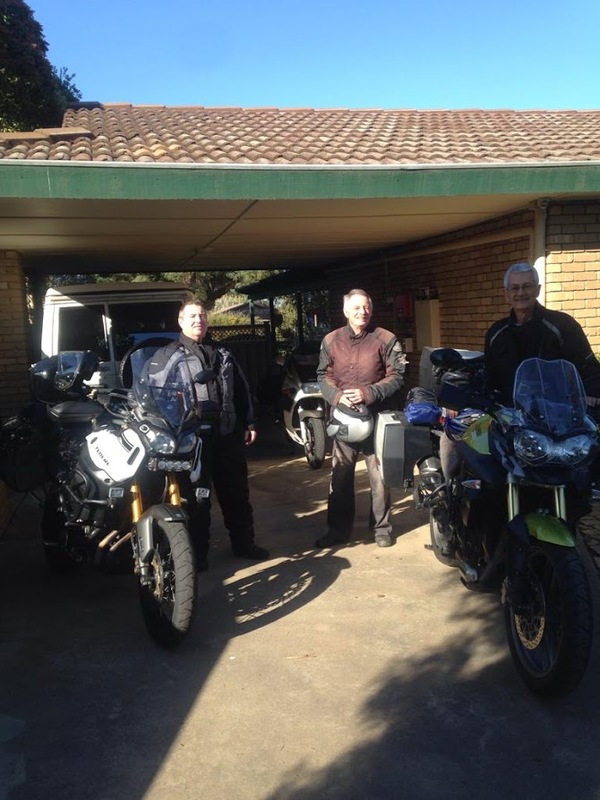 Fuel stop and morning tea in Narrandera, then up the Newell Hwy to Ardlethan. I had taken over the lead so from Ardlethan I headed off the Newell and led them to West Wyalong via Tallimba. After lunch at the bakery in WW our next stop was fuel at Condobolin. For the last 20km into town i noticed the old Suzuki dropping back, so I dropped the pace to 80kph. His fuel gauge told the story when we pulled up at the service station in Condobolin. The difference between the 30 yo Suzuki and the 3yo Yamaha is obvious at the fuel bowser. 13.4km/litre for the 1100 and 19.8km/litre for the 1200 ridden the same distance at the same pace. We took the bitumen route into Tottenham via Fifield and Tullamore. Arrived with plenty of daylight left to fuel up, buy supplies at the local supermarket and set up camp. A good feed at the lcoal bowling club that night, and some beers and stories and catching up with other rallygoers later. Saturday was a lazy day. 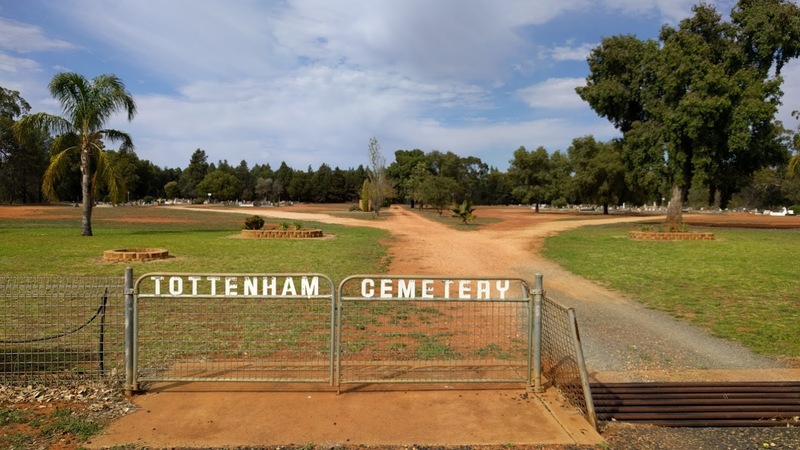 I read a book, rode down to Albert for lunch at the Rabbit Trap Hotel, and went for a walk to the local cemetery for a bit of a look around. The weather was perfect until after lunchtime, when the wind picked up. I had a relatively early night, but didn't get a whole lot of sleep thanks to the noise of the wind howling through the trees, and the walls of the tent occasionally flexing in. I was up early and packed and on the road by 7am on Sunday. Rather than the usual bitumen route out to the south I decided to head west. About 50km of good dirt road led to the Henry Parkes Way, about 50km north of Condobolin. Fuel for the bike here, and an egg and bacon sandwich for me, then I was off again. First stop was an art installation just a few metres south of the town. "Utes in the Paddock" was originally set up about 25km east of here, in Ootha, but was moved to Condo recently. Canola crops near Shepparton. I've never really noticed canola this close to Melbourne before, but I guess I haven't been looking in the right places. Home just before 5pm. Headwinds most of the way south from Lake Cargelligo, but thanks to the protection on the Super Ten I only noticed them on the fuel consumption which was running about 10% higher than normal for most of the day.